Harris Ranch takes the mystery out of preparing beef. With all the different beef cuts you can find at the market, all the various methods of preparing beef in your kitchen, and all the delicious beef recipes to choose from, it’s easy to become overwhelmed. Harris Ranch offers the following cooking tips to take the mystery out of beef preparation. When beef is allowed to age, the naturally occurring enzymes in it break down muscle fibers. Also known as conditioning, aging is a natural process that adds flavor and tenderness to the meat. What are the different steak types? You can purchase Harris Ranch Beef in a variety of cuts, each with distinct characteristics and flavors. Our Fresh Beef Cuts Guide shows where each cut comes from. Ribeye steak comes from the rib portion of the beef carcass. One of the most popular steaks, ribeye is boneless, juicy, and extremely flavorful because of its rich marbling. With the rib bone attached, the ribeye becomes a rib steak that has even more exceptional flavor. New York steak comes from the loin just behind the rib area. Hearty and prized for its distinctively rich flavor, this steak became associated with New York in 1937 when Delmonico’s Restaurant first opened in Manhattan. Porterhouse steak comes from the loin portion of the beef carcass. Perfect for hearty eaters, Porterhouse is the king of the T-bone steaks. It provides a prized and plentiful portion of tender filet mignon on one side of the T-shaped bone, and the unmatched flavor of a strip steak on the other side. T-bone steak also comes from the beef loin. Known for the same T-shaped bone as the Porterhouse, a T-bone combines the savory flavor of the strip steak on one side with a tender, juicy, yet somewhat smaller portion of the filet on the other. Filet Mignon is hand carved from the tenderloin, the most tender cut of beef. This elegant cut has exceptional, mouthwatering taste and melt-in-your-mouth buttery tenderness. How do you season beef? Premium steaks from Harris Ranch typically don’t require a lot of heavy seasoning, but prepared correctly, both marinades and rubs enhance the flavor of these delicious steaks. Used to ﬂavor the surface of uncooked meats, rubs contain a blend of seasonings. Dry rub ingredients include fresh or dried herbs and spices. Paste-type rubs often contain oil, crushed garlic or mustard. Commonly used with steaks and other thin beef cuts, a marinade is a seasoned liquid that adds flavor and in some cases increases tenderness. Successful marinating matches the marinade type and marinating time to the beef cut. Tenderizing marinades penetrate only about 1/4 inch into the surface of the beef. Beef marinated for longer than 24 hours in a tenderizing marinade may develop a mushy texture. Use a food-safe plastic bag, non-reactive glass container, or stainless steel container. Turn steaks or stir beef strips occasionally to allow even exposure to the marinade. Reserve some marinade before adding it to raw beef to use for basting or as a sauce. 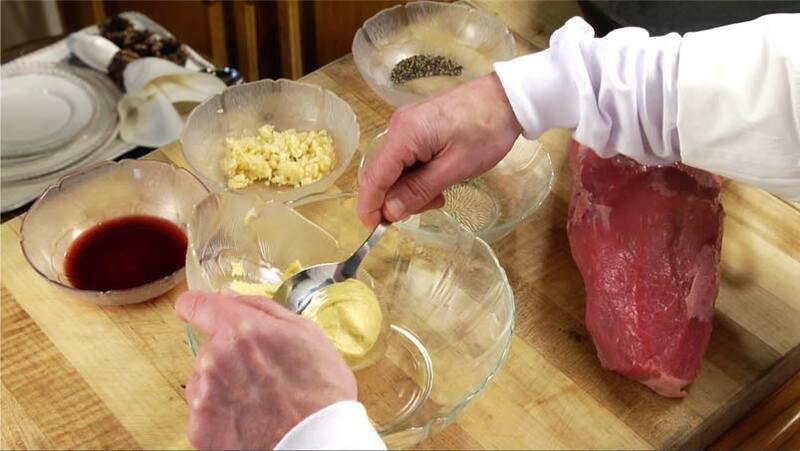 Never use marinade that has come into contact with raw beef for basting or as a sauce without first bringing it to a full rolling boil and boiling for at least one minute. Visit the Gallery to watch our video with Chef Reagan, Grilling the Perfect Steak or follow the simple steps below. Grilling is one of the most popular ways to enjoy beef. Whether cooking over gas or charcoal, nothing matches the mouth-watering flavor of beef fresh from the grill. 1. Begin by selecting one of the different steak types listed above. 2. Next, season your steaks to your liking. Be creative and experiment with our marinade and rub recipes or keep it simple with Kosher salt, pepper and garlic. 3. Bring your beef to room temperature for about an hour before grilling. 4. Grill over medium heat using charcoal or gas. Light the briquettes 30 minutes in advance. Begin grilling when coals are covered with a light ash and are no longer flaming. If coals are too hot, the beef may overcook on the outside before the interior reaches the desired doneness. Cooking over too hot a flame can char the outside of beef cuts while the interior remains underdone. 5. After cooking, allow your steaks to stand for 5 to 10 minutes before serving. While standing, the internal temperature will rise about 5 degrees. Be sure to keep that in mind to avoid over-cooking and reach your desired doneness. Use these suggested cooking times as a guide for cooking 1” steaks. Cooking times depend on thickness of the steak and your desired doneness. Check the internal temperature and color of the meat. Insert instant-read thermometer horizontally from the side. Do not touch bone or fat. Medium-rare is right in the middle.